Wednesday’s Autumn Statement by Philip Hammond is good news for housing on several different fronts. First, at long last housing is being recognised as infrastructure. That’s important enough in itself but Mr Hammond went even further by pitching housing as part of the solution to the key economic problem of productivity. Along with transport, digital communications and research and development, housing will be part of the chancellor’s £23bn National Productivity Investment Fund. In financial terms, accelerated construction, affordable housing and the new Housing Infrastructure Fund represent a third of the total cost. Mr Hammond also named “the housing challenge” alongside the productivity gap and the imbalance in prosperity across the country as one of the economy’s long-term weaknesses. You go away for the weekend and suddenly everything goes mad: it turns out that Iain Duncan Smith was really a Socialist or a Liberal Democrat all along. The Great Social Reformer (this is what the many ‘friends of’ IDS speaking to journalists call him) has not just resigned, not just skewered George Osborne, he’s also questioned the fundamentals of the post-2010 Conservatives narrative. We are not ‘all in this together’, the most vulnerable will not be ‘protected’ and the deficit reduction target is ‘more and more perceived as distinctly political rather than in the national economic interest’. Yet this (apparent) modern day heir to Tory Great Social Reformers like Shaftesbury and Wilberforce is also the same Iain Duncan Smith responsible for punitive benefit sanctions, the bedroom tax, the £30 a week ESA cut and all the other salami slices taken out of the social security system in the last six years that were not ‘compromises too far’. The man who took the moral high ground about cuts that benefit the better-off is the same one who stood on a manifesto of cutting inheritance tax and £12 billion from benefits. It’s time once again for a comprehensive overview of the state of the housing nation. Here are four key points I drew from this year’s UK Housing Review. This isn’t the first time the Review has made this point but it is the first time I’ve seen it summed up so clearly in one graph. All the rhetoric about universal credit says that it will reward those ‘hardworking families’ and help to end the ‘dependency culture’ of the benefits system. 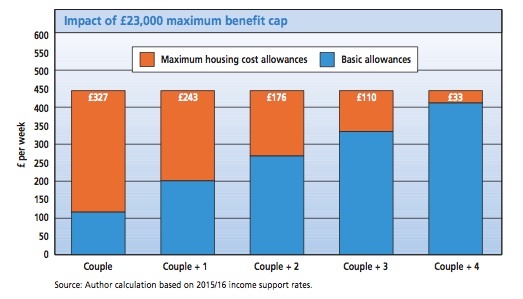 The new scheme does improve the poverty trap caused by the rate at which housing benefit is withdrawn as your earnings rise. A failure to include council tax benefit plus cuts in recent Budgets and Autumn Statement detract from this objective but it does still seem better designed to ‘make work pay’. However, there is a price to be paid for this improvement.